There are many things that we can claim as business expenses throughout the year, but there are also many things the IRS just does not find as an acceptable expense. Do you hear yourself saying: Can I expense that? This is such a common question for small business owners. There are just too many rules and policies out there to know every single item that can and can’t be expensed. Anything that relates directly to your business can be claimed as a business expense. If you bought it for your business, if it is a necessity to run your business or if it played a part in making a sale for your business – it can likely be expensed. Office supplies, advertising, payment processing fees and travel are just a few common expenses. I listed out quite a few more examples in the Rising Tide Society blog post last month – check it out here if you haven’t already. Keep copies of receipts. Whether paper or electronic, keep your receipts organized and filed away just in case you need to look back at them one day. If you start to question yourself whether the expense really relates to your business or not, it’s usually best to go with your gut and think like the IRS. #1 – You have a studio or office away from your home and you stop to pick up coffee on the way into said studio or office. Can I expense that? No. This is not a valid business expense. This would be considered a personal expense and it should be paid with personal funds. TIP: Buy a coffeemaker and supplies to make coffee in your office and then it’s a valid business expense. Win Win – you, your employees and your clients get to enjoy fresh coffee all the time. #2 – I’m going on vacation for a week with my family, but I plan to have a 1 hour meeting with a client while out of town – can I expense my travel since I’ll be meeting with a client? No. The IRS does allow you to expense travel when it the trip is primarily for business; however, in this case the trip is primarily for pleasure since you’ll be gone for a week and only meeting with a client for an hour. TIP: You can expense the mileage it takes you to drive to the location to meet with your client (ex: hotel to coffee shop). 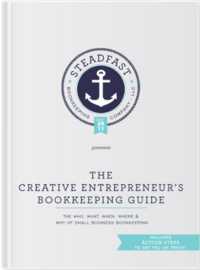 Find out more about Steadfast Crew and how you can master your books and get these expenses recorded in no time at all or hand it over to us and we’ll do all the expense recording for you. Oh my goodness, never thought of these tips! Thanks for sharing, no more coffee now, ha ha!